This is not the first time that Mr RB and I have been to the Jolly Poacher restaurant since it opened in November last year. Our last visit was a leisurely Sunday lunch with friends on a chilly day in March and it was nice to be there on a warm Thursday evening. The weather has definitely improved since our last visit and the menu has evolved too, it’s shorter, more focused, and I like that; for a start it makes it much easier to decide what to have. On this sunny Brighton evening we opted for a table inside, rather than catching the last of the sun on their outdoor seating area – the atmosphere was buzzy and the venue was suitably atmospheric for a school night. I chose the very summery sounding crab & lobster salad, fennel, orange & olives and Mr RB opted for the liver parfait. 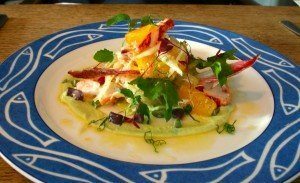 The fennel was crunchy, the lobster and the crab were fresh and, the dressing and orange made it refreshing; it was sweet and tart and had a touch of bitterness that I later found out came from a dash of Aperol. (I hadn’t heard of it but on closer inspection of the Internet of knowledge I have discovered that it is an Italian drink. Pimms meets Campari if you like). I am writing this on a sunny Saturday and I have to say that thinking about that salad is making me want to eat it again. It was just lovely and perfect for this weather. 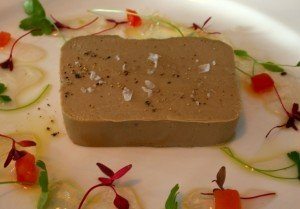 For summer offal consumption the parfait was delicious and light, served with a muscat jelly and some very delicately arranged garnish and toasted brioche. 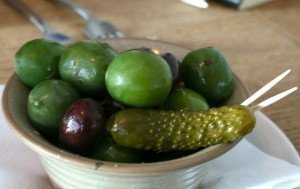 I have just realised that I have totally omitted to mention the great selection of olives we were given while we selected our food. I thought this was a nice touch. It helps, I find, not to be really hungry when choosing food and it is even better to take the edge off before the bread is delivered to the table. Munching through a small bowl of olives and cornichon at least felt like a healthier alternative. On to the mains. 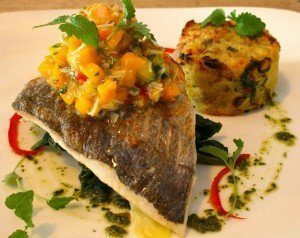 Mine: grilled fillet of bream, crab & mango salsa, crushed New Jersey royals and spinach. His – wait for it – char grilled sirloin steak, chips, baby leaf salad and, horseradish sauce. The first thing to note about these two dishes is that one looks fresh and delicate, feminine if you like, and the other was a big plate of man food. The steak looked enormous from where I was sitting and Mr RB declared the char grilled element to be very welcome. The horseradish was delicate in flavour, not too up your nose – if you know what I mean – and was a lovely accompaniment to this lovely, tender steak. The chips were really excellent and I confess that, though there was nothing wrong with the Jersey Royals, I couldn’t resist nicking his chips, they were just too good. Let me tell you about the mango & crab salsa that was served with my bream. It was sweet, it had a bit of bite too it and, as the sweetness came from a perfectly ripe mango, it also had a bit of the juiciness that my starter had.. ..Very different flavours of course but the same refreshing feeling. In fact, it all felt so light and lovely that we braved two whole deserts instead of the frequently selected one to share. 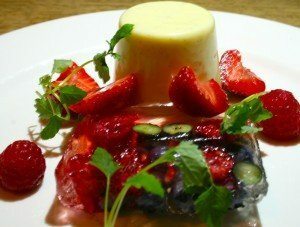 Eaton mess and, vanilla panna cotta and elderflower & summer fruit jelly. Of course the Eton mess was good. Fresh strawberries, lovely cream and a crunchy meringue, exactly as expected, no embellishment, no messing. The vanilla panna cotta was a different thing entirely. It was pretty, sitting there alongside a perfect slice of elderflower jelly with all those perfectly preserved blueberries and raspberries. It was pretty and it was delicious. Thinking about it now, I could eat one of those again too. The Jolly Poacher is a family business. Tony is, like many chef owners, absolutely passionate about what he does and his food shows that. 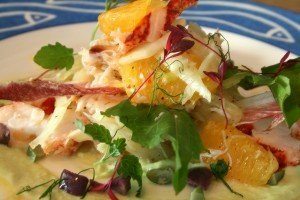 Dishes like my crab and salad lobster starter show a tasty level of creativity and the skill to experiment and steak, the Eton mess, they show a commitment to great ingredients and flavour. 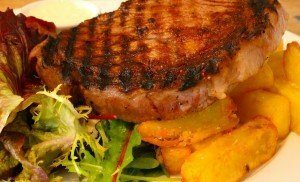 The Jolly Poacher has been open for almost a year now and in our opinion it has positioned itself as one of the top restaurants in Brighton and Hove. It is super friendly and a great looking venue, we like the fact that their kitchen hot plate is facing onto the dining area so you can see what is going on, plus we think it is reasonably priced. I am already looking forward to my next visit as I suspect that the Jolly Poacher will continue to evolve and that there are a few more delights awaiting us!